Chinese style steamed fish recipe. 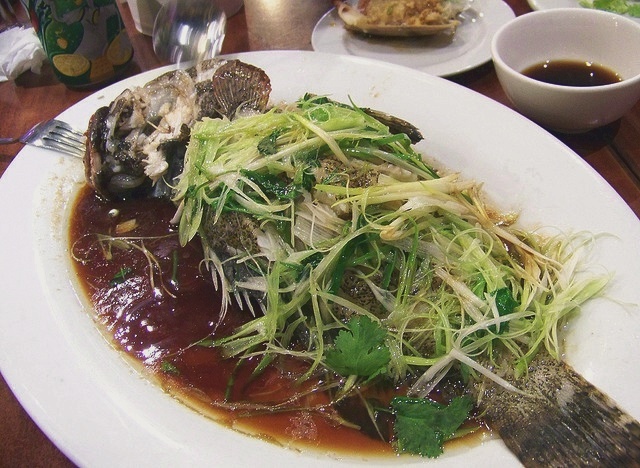 This is how to cook steamed fish stuffed with ginger, garlic and sprinkled soya sauce. Clean the fish properly (discard scales, guts, gills, etc.) then patting it dry with a cloth or paper towel..
Shred ginger. Chop garlic finely. Mix ginger and garlic with oil. Stuff inside of fish with some ginger mixture and spread remaining mixture on fish. Steam on high heat for 8-10 mins till cooked. Discard the fishy and cloudy fish "water" after steaming. Sprinkle light soya sauce on fish. Garnish with spring onion and pepper. Serve hot immediately with rice. I don’t have a steamer though so this is how I cook it. I put about 1 tbs grated ginger and 2 chopped cloves garlic in large pan, warm in 1 cup warm chicken broth for about 1-2 minutes. When comes to boil, add about 2tbs soy sauce, add codfish cover with sliced mushrooms diagonally, chopped spring onions, spoon broth over fish, cover, cook about 5 min. Super simple and fast!